Producing offspring without a mate? This zebra shark managed to do it. 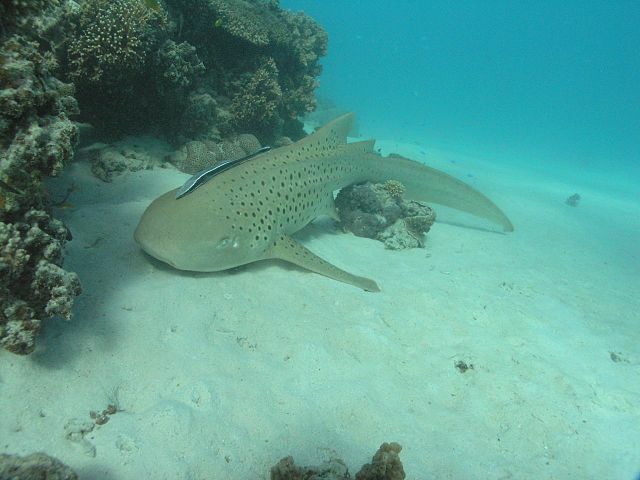 A female zebra shark named Leonie living in an aquarium in Australia, has produced offspring – without a mate. The shark was separated from its long-term mate over three years ago and has been living without a potential shark to reproduce with at the Reef HQ aquarium in Townsville. However, baffled scientists have discovered she was able to reproduce offspring asexually even though mating with a male is the usual way this particular female has reproduced previously. Asexual births aren’t that rare – it’s been observed in sharks and other vertebrate species such as rays and reptiles and thought to be an evolutionary survival tactic when going through periods of isolation. However switching from sexual to asexual is less common and less observed. Scientists are still unclear as to how this happened and offered up the suggestion that sperm stored from previous mating sessions was used by the female shark to reproduce. Sperm storage has been noted in sharks before. It’s thought to be down to males needing to spend long periods of time away from females, meaning females store sperm in order to keep the lineage of the male continuing for longer. Despite the possible solution to the conundrum, the way in which this female shark changed the way she reproduced has amazed the staff and scientists at the aquarium. Details were published in the Nature’s journal Scientific Reports.